Building on the success of ClubSiteFootball, Chief2moro set about exploring similar opportunities for local tennis clubs who were keen to gain professional looking websites that they could maintain and run. 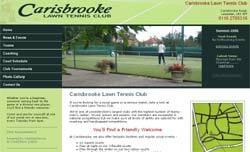 The Carisbrooke LTC website is the prototype for ClubSiteTennis, which is envisaged as a subscription based web service along the lines of ClubSiteFootball. ClubSiteTennis specialises in helping the tennis club keep in touch with it members. It features an enhanced auto-email facility that automatically emails members (who are signed up to the club mailing list) when new content is added to the site. Other features include a photo gallery, online court scheduler and a club event notifier.